Authors: Eric E. Mamajek et al. Hubble images of Pluto, taken at different times over a Plutonian day. Pluto is around 2,400 km in diameter, or 2/3 times the size of the Earth’s moon and is 40 times further from the Sun that we are, so it’s pretty tiny in Hubble’s field of view. In fact, it only covers 3 of Hubble’s pixels! In July of this year (2015), NASA’s New Horizons mission will fly past Pluto and its moons. It will map the surface of the Plutonian system in unprecedented detail, revealing craters and other surface features for the first time. In preparation for the deluge of newly discovered craters, mountains, crevasses and other surface features, Mamajek et al. discuss a naming system for Pluto and its moons. Pluto is one of the last large planetesimals in the Solar system to have its surface imaged in detail. Pluto’s surface features will reveal the history of its life in the alien conditions at the outer-most edge of our Solar system. The images on the right were taken by the Hubble space telescope. They show Pluto’s surface at different times during a single rotation. Fuzzy blobs of colour hint at interesting surface features. The International Astronomical Union (IAU) is pretty strict about naming conventions. To name anything in the Solar system you have to submit a naming request which goes through an approval stage. They wouldn’t, for example, like the surface features of pluto to be named after the discoverer’s cats. An image of Triton, a moon of Neptune taken by Voyager 2. The surface features of Pluto are expected to be similar to those captured on Triton. When Pluto was discovered back in 1930 by Clyde Tombaugh, it was named, as was traditional, after a Roman deity: Pluto, the god of the underworld. To continue along the hell theme, the IAU states that the surface features of Pluto should be named after “Underworld deities”. But how many of those can there be? Won’t we run out pretty quickly? And what about different classes and sub-classes of surface features? Take Triton, for example. It’s a moon of Neptune and, arguably the most Pluto-like object in the inner Solar system. On Triton’s surface (which has already been imaged), there are 12 different classes of surface feature. In this white paper, Mamajek et al. put forward some naming systems for the different surface classes that will inevitably be uncovered on Pluto and its moons. For the albedo features on Pluto’s surface, i.e. features produced by variations in reflectivity, Mamajek et al. suggest naming after “Deceased people and places associated with the discovery and characterization of Pluto”. For craters they suggest “Underworld deities and locations from mythologies around the world”. For example: “Mictlan (the Aztec underworld), Wepwawet (ancient Egyptian mythology), etc”. For other types of surface features, like chasms, mountains and valleys, they suggest using words that mean ‘cold’ in extinct languages (similarly, mountains on Mercury are named after obscure words for ‘hot’). Footage of Pluto and Charon from New Horizons, taken in January 2015. Click to watch. “A Moon over Pluto (Close up).3” by NASA/Johns Hopkins University. The IAU suggest that Pluto’s satellites should be named, “for characters and creatures in the myths surrounding Pluto (Greek Hades) and the classical Greek and Roman Underworld”. Mamajek et al. suggest that albedo features on the moons should be named after people involved the with discovery of Pluto’s satellites and that the craters should be named after “characters, places, and starships associated with the Star Trek series of television shows and movies by American screenwriter and producer Gene Roddenberry (1921-1991). Examples: Kirk, Spock, McCoy, Sulu, Uhura, Chekov, Scotty, etc”. There is a precedent for naming surface features of Solar system bodies after fictional places and characters: Titan’s mountains are named after mountains of Middle Earth and its surface features are named after Lord Of the Rings characters and planets from Dune. There is also an asteroroid called James Bond (9007) and another called Monty Python. New horizons will be at its closest approach (at 10,000 km) on the 14th of July, 2015, but it has already spotted Pluto. The video above shows footage taken by New Horizons in January of this year. For more information on IAU naming conventions, click here. For names of Solar system bodies and surface features, click here. 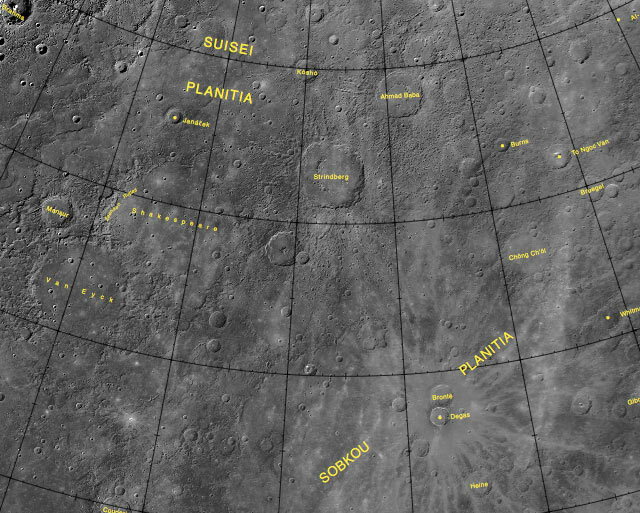 The surface of Mercury with named features. Proves to show that our age’s mythology is in the tales told in cinema classics. 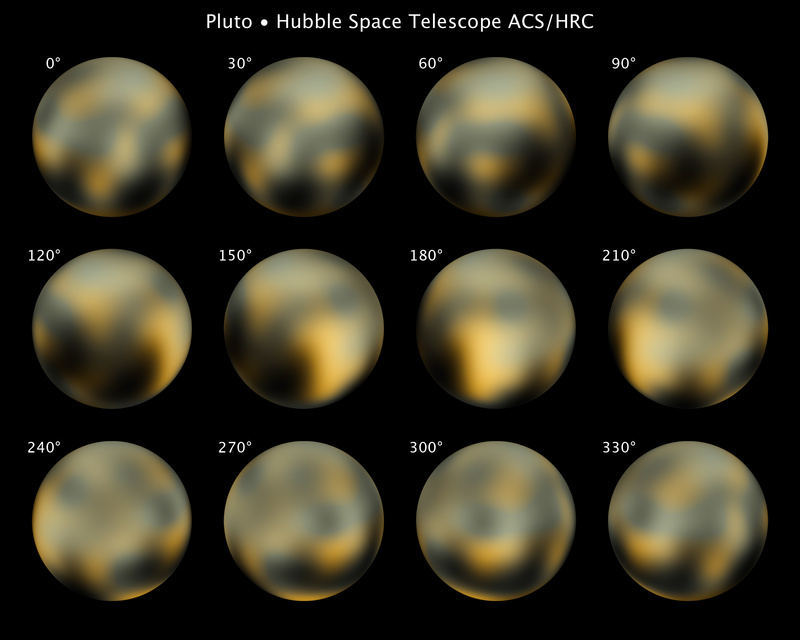 I can’t wait to see how pluto looks like in image with as much resolution as the one of mercury or titan. I’m curious about how much interesting information they can actually glean from these features… what are they looking to find? Info about its formation or its collisions or… ? This reminds me a little of being able to buy the naming rights of different stars for $50 out of a magazine. Seems kind of funny to name things this way, especially since future generations will likely have no knowledge of Star Trek whatsoever. But still pretty cool that these classics will be memorialized at least for a little while through this naming process. Thanks for this neat post! 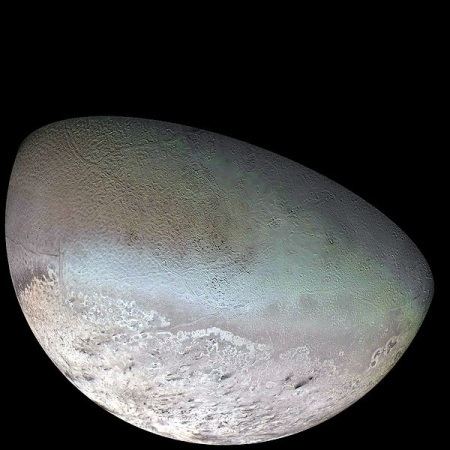 Why is it that Pluto’s surface features are expected to look similar to Triton’s? I think it would be interesting to begin naming some important discoveries after the myths and deities associated with other cultures. Our current solar system is highly eurocentric and it would be great to see some diversity, such as the Aztec and Egyptian names suggested in this article. I had no idea the naming process was so strict! I love that they could name features after Star Trek characters. I’m really interested to see the images of Pluto as well! This is crazy and will likely lead future astronomers to much confusion, but very nice nonetheless! I can’t wait to see the clear images of Pluto and Charon and see if the names chosen would fit in nicely with the outstanding features of these two celestial friends. Star Trek names would be wonderful because it would be like–Exploring strange new worlds–and BE the worlds explored! Still, I’d like to see more of the celestial world names, to bring some light from above? Like Angel’s Cove, Seraphim Sea, or The Throne of Light, sound very light-giving to perhaps a dark surfaced planet. Or, other world cultures too. Also, if I may add, some Native American tribe names or outstanding leader of a Native American tribe would be appropriate too. The underrepresented cultures from around the world–whether indigenous or not– that if not for dedicated researchers and environmentalists, would probably go unnoticed and extinct should also be included in the lists. But, still, it is wonderful that before I reach my 60th birthday next month that I will be alive (God willing) and able to say that I got to see a perfect image of Pluto and Charon from my little blue home. What a blessing.